Zostel Kathmandu i Katmandu, Nepal : Boka nu! I've been traveling Nepal for more than one month now, staying in many different hostels all over the country - and I'm still coming back to Zostel over and over again. 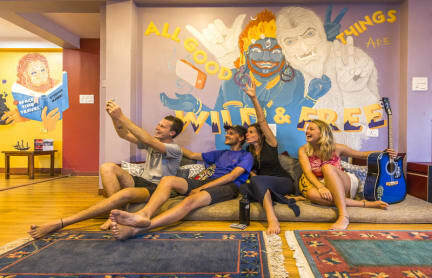 It's by far the cleanest and most comfortable hostel I've been to during my trip, and on top of that it has one of the best social atmospheres with an amazing common room, bar and rooftop. It's difficult to get a room since is fully booked all the time - but if you do you won't regret you stayed here. 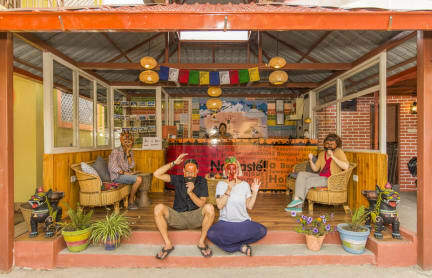 The perfect stay in Kathmandu, central location, a very nice and friendly vibe, easy to meet and talk to both fellow travellers as well as the owners and staff. Good athmospere, not too loud or partyheavy but not boring either, perfect mix of socializing with peace and quiet as well, depending on what you want at any one time. Very clean and organized and easy to have your requests met. The owners go out of their way to make sure you feel welcome and taken care of! Would stay here again!